By Dale Johnson Posted: July 31, 2017 6:00 a.m.
A book looking at the impacts of drought on the prairies is gaining national and international recognition. Vulnerability and Adaptation to Drought: the Canadian Prairies and South America – co-edited by three Sociology and Social Studies faculty members, Harry Diaz, Margot Hurlbert and Jim Warren – has been shortlisted for two upcoming book awards. “I think what most impresses awards panels about the book is its depth and scope,” says Warren. “The book takes an interdisciplinary approach and includes chapters by 23 scholars and practitioners from the range of disciplines required to understand drought from several highly relevant perspectives: climatology, paleo-climate science, climate change, science, economics, history, public policy, sociology as well as sustainability and vulnerability perspective. It takes a wide geographic perspective, focusing on both the Canadian Prairies and southern South America,” he says. 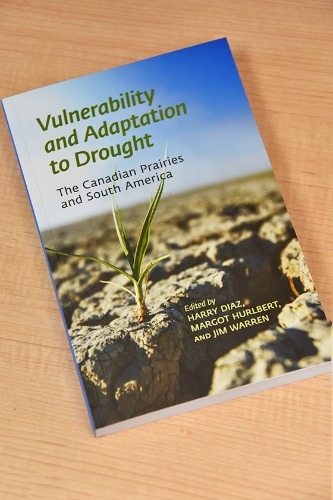 Vulnerability and Adaptation to Drought: the Canadian Prairies and South America is shortlisted, along with three other books, for a scholarly publishing award at the Alberta Book Publishing Awards. Winners will be announced on September 15 in Edmonton. The book is also been nominated in the Medicine and Science category for the High Plains Book Awards, in Billings, Montana. Nominees are accepted from Montana, North Dakota, South Dakota, Nebraska, Wyoming, Colorado, Kansas and the provinces of Manitoba, Saskatchewan, and Alberta. Winners will be announced in Billings, Montana on Oct. 21. “I believe this book's recognition by awards juries is a bit of icing on the cake for efforts going back over a decade by scholars from the U of R in the areas of climate change science, vulnerability, and adaptation to climate change drought and water management policy. I also think it is a great tribute to Harry Diaz, who has been a leader in efforts to view climate change challenges through the lenses of interdisciplinary and international study,” Warren says.